Oh Yum! These no-bake granola bars are my new, favorite pick-me-up. You can cut them into bars or shape them into balls, for a cool, summery treat. I'm using my bee teacup, which goes along with my honey ingredient in the bars. Little bits of chocolate and dried cherries gives these bars a nice flavor explosion. Wouldn't they make a nice lunchbox treat, too? Put all ingredients in a mixer bowl and blend well. Spread in a 9x13 baking dish and refrigerate for 1 hour before cutting into squares. You could also refrigerate the mixture and then shape into balls, if you prefer. Yes, Nana's Cooking Camp is still going on! 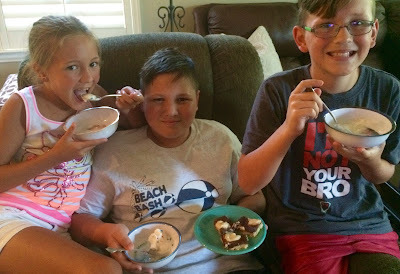 Three of my seven grands made homemade vanilla ice cream and Debbie's Can't Leave 'Em Alone Bars, which are easy and kid-friendly. These kids sure enjoy cooking and are great little helpers! You must have read my mind, Kitty! I've been searching for a packed lunch bar recipe for my hubb's lunch box, and this is surely it! Am definitely trying. Hope I can keep my hands off them so that there are some left for the purpose! Kitty, I'd like to enroll in Nana's Cooking Camp please! I so enjoy the photos of your grands and seeing what they're cooking next. Your no bake granola bars are perfect for the lazy days of summer. I always want a little bite with my coffee in the early morning hours before I have breakfast a couple hours later and the balls are a perfect solution, thanks for the recipe! Now those do you yummy! I have bookmark this so I can make them.Thanks,Kitty. I love granola bars for breakfast Kitty, and yours sound so good, homemade with peanut butter, oats and chocolate, you are speaking my language! I've got to cook more with my grands, you are the best Nana! The key here is "no-bake". That caught my attention right away. I will be trying these this week, because I love all the ingredients in those bars. Pretty setting with the bumble bees. Kitty. Stay cool this week! Glad to see "Cooking Camp" is in full swing! Not only are you providing one of a kind memories, you are also teaching some much valued cooking skills. This recipe is perfect for two reasons: It's no bake and it's going to be 100 degrees all week here & the other granola bar recipe I have had close to fifteen plus ingredients. Cooking Camp with Nana is awesome Kitty. What a sweet Grandma you are. The granola bars look great. I shall try making some. Stay cool Kitty. OH my goodness Cooking Camp looks like so much fun. I love granola bars but haven't tried them with cherries. Yum. Love the sweet little teacup too! Yum, these are easy and delicious. I like that there is no coconut in them. Too hot to put the oven on. Can you believe I never tasted a German pancake? They look amazing, though. 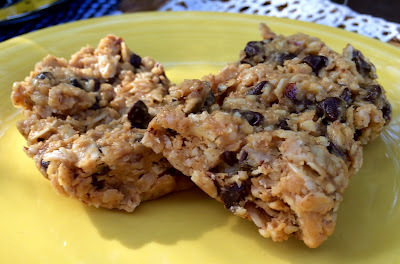 My grands would love to help making these granola bars and eating them too. Us older kids would like them too. Stay cool. It's so hot here. Hi Kitty, wow the granola bars look so good. I definitely will be making these. An afternoon pick me up would be perfect with one if these. The grands are adorable and sure have a wonderful time in your cooking camp. You make it so special. The ice cream is the best treat for these really hot days. 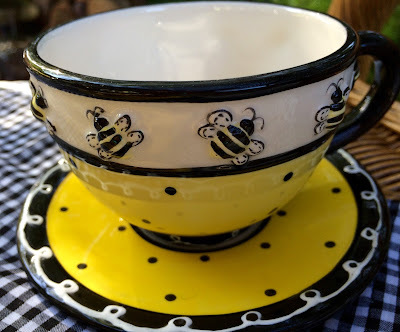 Your bee teacup is too cute! The no-bake granola also looks like a healthy treat that will satisfy my sweet tooth. 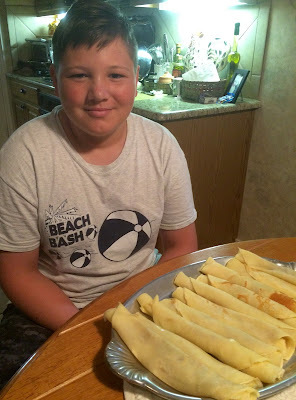 I'm always intrigued by what your grandkids create at Nana's Cooking Camp! I love ice cream, but have never actually made my own so perhaps it's time to invest in an ice cream maker (just imagine all the tea-flavoured ice cream I can create!). The no-bake granola bars look tasty Kitty, would be nice for a grandma with her tea. I'm happy to see the cooking camp continues and I'll have to check out the rolled pancakes that are a hit. Those smiles are worth every single drip/spill/mess ever made! I love that they come to cook with you, Kitty. All your pretty black/white & yellow look soooo pretty & summery....very cute! Thanks for sharing another winning recipe! Hi Kitty, The granola bars look delicious and would be something I would enjoy with my coffee for breakfast. Love the pretty bee teacup and saucer, gorgeous colors! I'm loving those sweet faces of your grands. What wonderful memories y'all are making………. Kitty, the homemade ice cream and granola bars are calling my name! I am having overnight guests soon and may have to make those German pancakes. My son Bryon always requested pancakes with chocolate chips. It's always a pleasure to visit Kitty's Kozy Kitchen and Nana's cooking camp! I'll have to make those so as to have on hand and I'll likely make them into balls. I use a recipe from a post of yours that you shared some time ago, Kitty. Your bee cup is very cute. Kitty, I see that almonds are added twice...once ground and once sliced...it that right? I will be making these as the look pretty healthy! You make delicious things. Those unbaked bars would be perfect during these hot summer days. I always like to have something on hand for my husband's lunch. What a great Nana you are - your sweet grands must have a wonderful time with you. Oh yum, I love dried cherries! I have got to try making these Kitty. You are the best Nana!! So glad you will be sharing with SYC. Kitty, your grand kids are the sweetest! The granola bars do look yummy good, but I have to agree with your grandson and ask for a plate of those wonderful pancakes! lol! They look delicious Kitty! And no dairy! Yay! Oh everything looks so tasty! 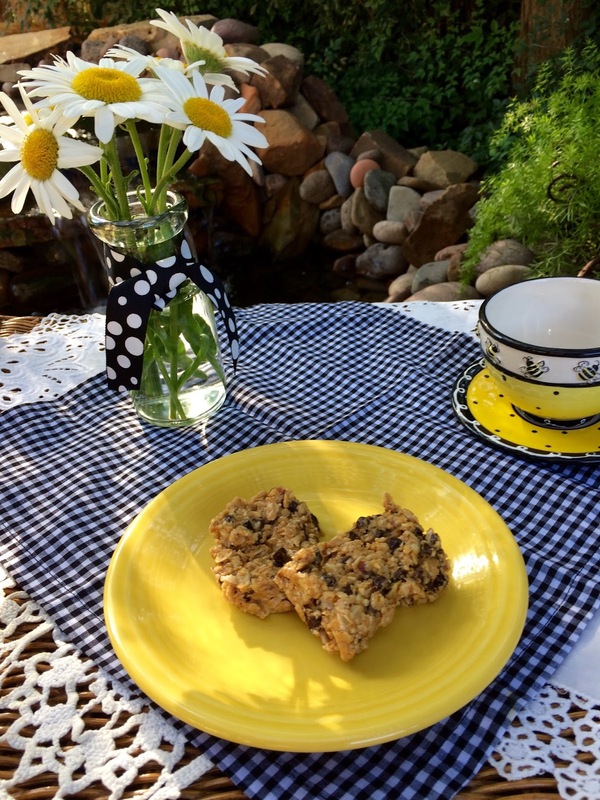 I love recipes like these lovely granola bars - YUMMM! The pics of your precious grands is adorable. How wonderful you're able to make so much fun and memories with them. Awesome! Your no-bake granola bars sound perfect right about now. I was having a coffee craving so I made a pot and am now enjoying a cup while I catch up on blogs. Now see?! There go all my excuses. They look and sound yummy. Wonderful post, Kitty! Thank you for the recipe - just may have to try making those....nice when has a choice to make a nutritional treat that doesn't heat up the kitchen when doing so! Your grands are so sweet - I LOVE you have Baking Camp, that is the coolest idea. Somehow NOW I am keeping notes of those great Grandma ideas! Thanks! Those granola bars look and sound delicious. Such a cute teacup and the granola bars I will have to make! My grands love grampa's pancakes so I get time off when he makes them! Have a great weekend dear Kitty! Kitty, love that cooking camp! AND "no-bake"? I'm loving that right about now! May your grandchildren never forget what a truly grand grandmother they were blessed with! Your grandchildren must love visiting you…such big smiles on their faces. I think I'd have one too after eating one of you granola bars. I want to come to your camp, you'al are having so much fun!! Your No Bake Granola Bars are perfect for this hot weather we are about to have. We did get some nice rain, I think you'al got more than we did for a change. Thanks so much for sharing with us at Full Plate Thursday and have a great weekend! You must be a great teacher because just look at these grandchildren - amazing and having fun while learning. Thanks for sharing! What a precious grandmother you are. I would love to have you as a cooking teacher! You are the best grandmother Kitty. The kids just look so happy. How fun for you all. The no-bake granola bars look great, and those are darling grands! I know you all enjoy each other so much. Reading this post makes me miss my grandmothers; they were so sweet. Have a great week, Kitty! What an adorable teacup! Those no bake bars look delicious and I love incorporating local honey into my recipes :) Thank you so much for sharing this with us at Dishing It & Digging It!